Since the website only introduces the characters from Kazuto’s side, or the Shu faction, I decided to introduce the other armies here, starting with Toutaku’s army. "Uhh... umm... It's my fault... So of course people will hate me..."
She is known by others as the wicked tyrant who drove the Han Dynasty to ruin… but she is actually a weak and timid person. After capitulating to Kazuto and the others for certain reasons, she becomes Kazuto’s personal maid and spends her days serving him. As thanks to Kazuto for saving her life, she wholeheartedly devotes her entire being unto him. She’s also very dependent on others and quick to fault herself. "Ah, awawa! I never knew it would turn out like that! Agh, you jerk, jerk, jerk!" Kaku is positively in love with Toutaku alone, and extremely devoted to protecting her. She excels at devising cool-headed and cold-blooded strategies, but she is also an extreme klutz utterly abandoned by the god of fortune so her tactics usually fail. That’s only the beginning, too: should she run, she trips; should she be eating her favorite snack, it will fall to the floor; and other similar misfortunes plague her everyday life. However, she fails to realize it is due to her own misfortune and lashes out at those nearby. After Toutaku capitulates to Kazuto, Kaku becomes his personal maid as well, seeing it as the only way in which she can protect her beloved, innocent Yue from his filthy, perverted desires. 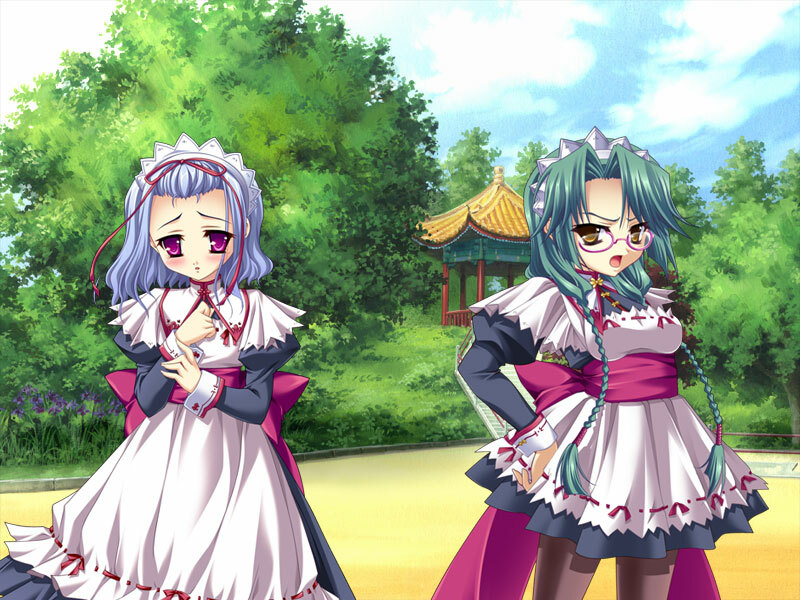 She also can’t stand watching her precious Yue open up to him, nor the fact that on top of being reduced from a nation’s strategist to mere attendant she’s forced to wear a frilly frilly “Maid outfit”… whatever that term is supposed to mean. "......The weak person is being loud." 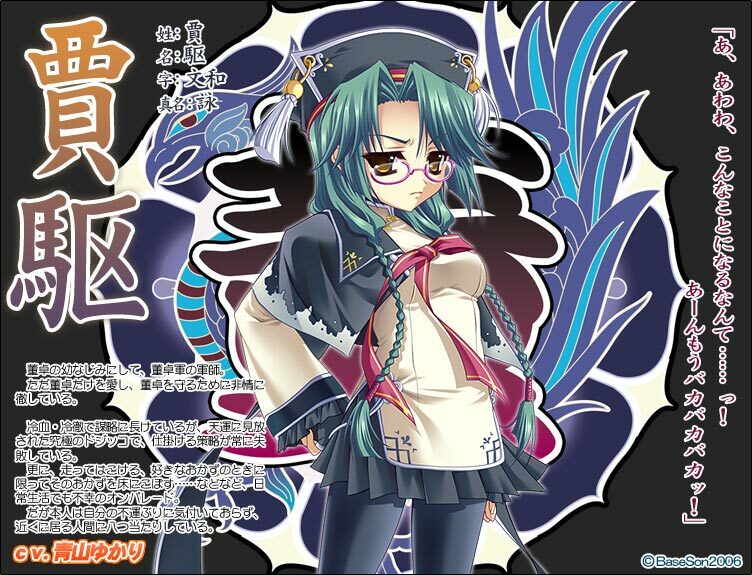 Ryofu is heralded as the strongest warrior in all of the Three Kingdoms, and stands before Kazuto and the others as a member of Toutaku’s army. She speaks very little, and only shows just as little expression making it difficult to understand what she’s thinking. However, the truth is she’s a lonely person and likes to keep stray cats and dogs she picked up in her room. Due to the antagonistic nature of their meeting and Ryofu’s poor communication skills she doesn’t get along very well with the other generals under Kazuto’s command at first, but they eventually open up to each other. "If you think you can take my spear, then give it your best shot!" 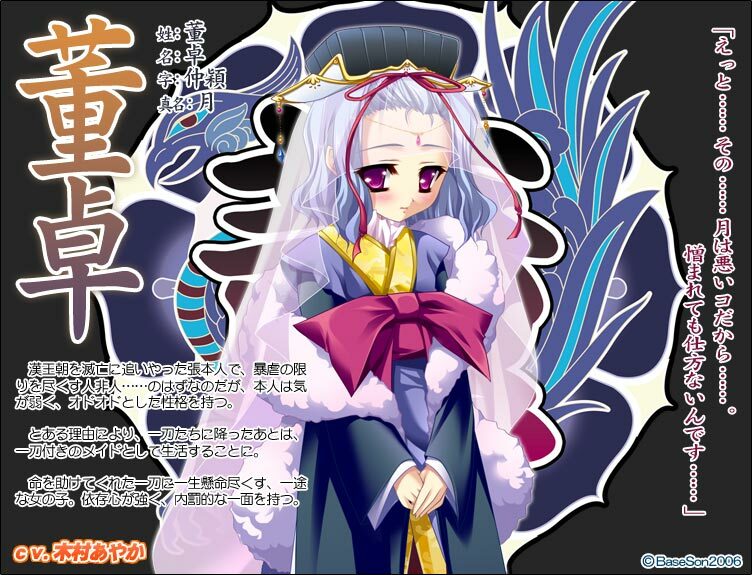 Chouryou is but one of Toutaku’s generals, and she fought to defend Hulao Pass together with Ryofu. She is a proud general who carries a strong sense of chivalry and takes pleasure in displaying her own military prowess. As she crosses blades with Kan’u, she comes to fall in love with her, and eventually joins your side to pursue that love. This entry was posted on Wednesday, January 5th, 2011 at 12:50 pm and is filed under Character Introductions. You can follow any responses to this entry through the RSS 2.0 feed. Both comments and pings are currently closed. Sure would be nice to actually get those voices in the game. I’ll be buying it. Hopefully enough others do as well to get voices. So hold on… I keep getting my history jumbled up, especially with the confusion between Japanese and Chinese names. The main character’s faction is the people who traveled with Liu Bei, right? That makes this… the Han empire that eventually is led by Liu Bei (the so-called Shu Han empire)? So we’ll be getting posts covering Eastern Wu, Cao Wei, and other factions in the coming days/weeks, I assume? Shu Han = Kazuto’s army with Kan’u (Guan Yu), Chouun (Zhao Yun), etc. The war against Dong Zhuo serves as a prelude to the Three Kingdoms era and as such, serves as the starting point for the tale. I’m interested to see how a lot of the bloody betrayal plays out when projected into moedom. 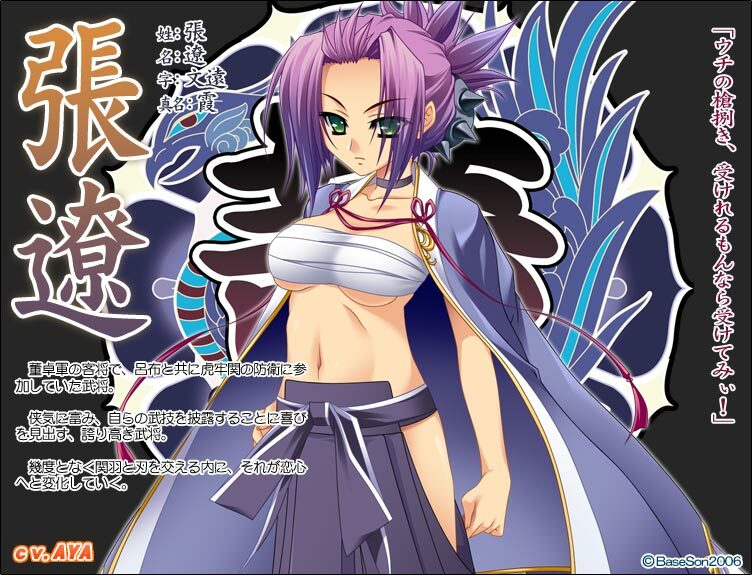 There are 31 voiced characters in Koihime Musou. So nearly 2-3 times that of most eroge, and that doesn’t count any of the faceless mob characters or the ones only mentioned by name. Wait those guys are voiced too? Is this one of those games where the only one who isn’t voiced is the MC? MC, Oikawa (who only shows up in the first script and wasn’t voiced in Harukoi either), and the mob characters (faceless soldiers, attendants with no sprites, etc.) are the only ones not voiced. =D Just wait till you see who voices those guys too! Even though Chousen says 「ああいうコが、歴史に残る英雄になれるんでしょうねぇ」 in the extra story in the second game… Well, even historically it’s not like she (he? whatever) did anything important anyway. A good version of Dong Zhuo…very interesting to say the least. Can’t wait for the release of this game. Ok, I’ll admit, the strikeout got a laugh from me. I find the creator’s idea of “true name” to be quite hilarious. I find Ryofu’s character to be the most delicious. *sinister laugh* only problem is…what if all the generals turn back to their true self!!!!!!!! well guess thats why its fantasy moe! On another note: 110 points for Kaku moe moe maido!!! *High fives the fellow Yukari fan* I know, she’s amazing XD I love her too. Heck, she didn’t take #1 in Toranoana’s most liked eroge VA for no reason. She’s also in Harukoi Otome as Riru as well. What’s the longest route in that game? Umi/Riru fan here. Based off of the OVAs, of course. It wasn’t the first one to my mind, but Chelsea Rorec is without a doubt one of her other roles, yes. Well, that comment was more of a joke at TU’s obscurity since I only know like 2 other people who saw this anime besides me. 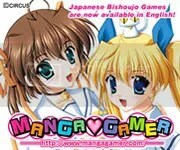 A bit offtopic, but now that you mention Imayura Honoka and Oretsuba, has Navel or MangaGamer expressed any interest in bringing over that series? I know it’s slated to have an anime adaptation later this year, which could be a good opportunity. I fully endorse megane on my meido! Chouryou is one of my favorite characters in the series. I’m glad the game has more of her than the anime did. Seriously, Chouryou had obviously just fallen for Kan’u and barring a fourth season in the future, that’s where the show left off. So much wasted potential. P.S. 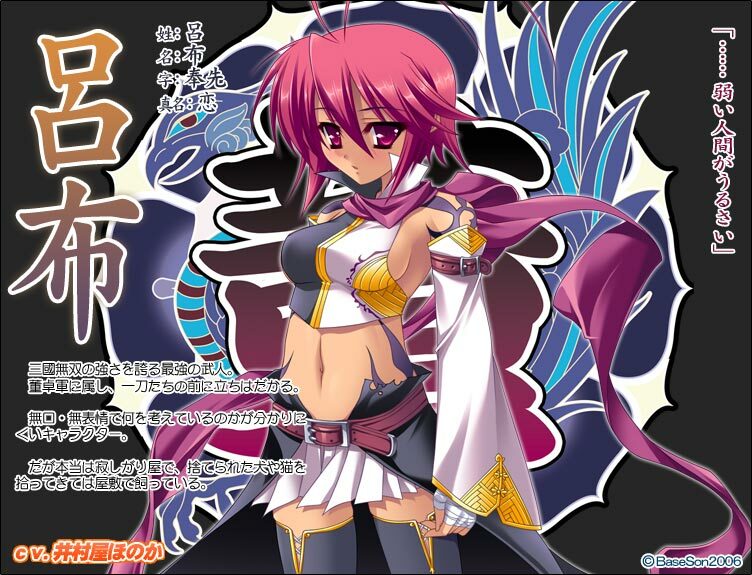 would MangaGamer be so kind as to post Sousou’s faction next, they are a fan-favorite for obvious reasons. Watch the 4th episode of the first season to see why. Sousou’s my favorite too, but there’s a method to my faction order posting. Best faction is already on the website ya know. Oh crap Ryofu, kaku and Chouryou seems incredibles. I would like to play their rute if thoose rutes existed. silvercitizen on Magical Teacher Giveaway! Anonymous on Magical Teacher Giveaway!